The year is 1963, and preteen Florine Gilham’s life is idyllic. She lives in a small coastal Maine community enveloped by her loving parents, grandmother, and her three close friends. Her dad, Leeman, a hard working lobsterman, wholehearted loves Carlie, Florine’s mom, but Carlie is a restless spirit. When Carlie goes on her annual vacation with her best friend Patty to northern Maine, she turns up missing. Florine and her dad are devastated. Did Carlie flee on her own volition or has she been kidnapped? Leeman cannot deal with his wife’s disappearance, so Florine leans on her friends, Dottie, Bud, and Glen, as well as her beloved Grand to get her through her heartbreak. 1963 proves to be a turbulent year, not only due to Carlie going missing, but also with the assassination of President Kennedy and the beginning of unrest in the country. Living in a small isolated town does not exempt the residents from tragedy, and Florine finds herself sinking into a pit of despair. Florine is unable to deal with seeing her mother’s things on a daily basis, and the fact that Leeman is now finding solace in the arms of Stella, a woman Florine despises, but one who has been in love with Leeman for many years. She moves in with her grandmother, never once forgetting her beloved mother nor getting over the despair of her loss. Grand, Godfearing and loving, embraces her granddaughter and keeps her busy with making bread and knitting. Florine becomes more withdrawn throughout her teenage years, still wishing and praying for Carlie’s return. Her heart is further broken when Bud, the boy she loves and determines to spend the rest of her life with, informs her he only considers her a friend. Tragedy strikes more than once, pulling Florine into an abyss of depression—an abyss she may never climb out of. This tender, coming of age debut novel is seasoned throughout with similes and metaphors, adding spice to the characters and the description of this scenic yet secluded setting. 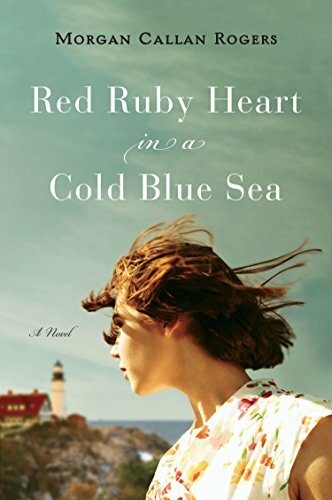 Written in the first person, Red Ruby Heart in a Cold Blue Sea by Morgan Callan Rogers draws the reader into the plot, making us privy to Florine’s innermost thoughts and sorrows. The nostalgic sentiment enveloping the time period proves both bittersweet and captivating, making this a profound tale.